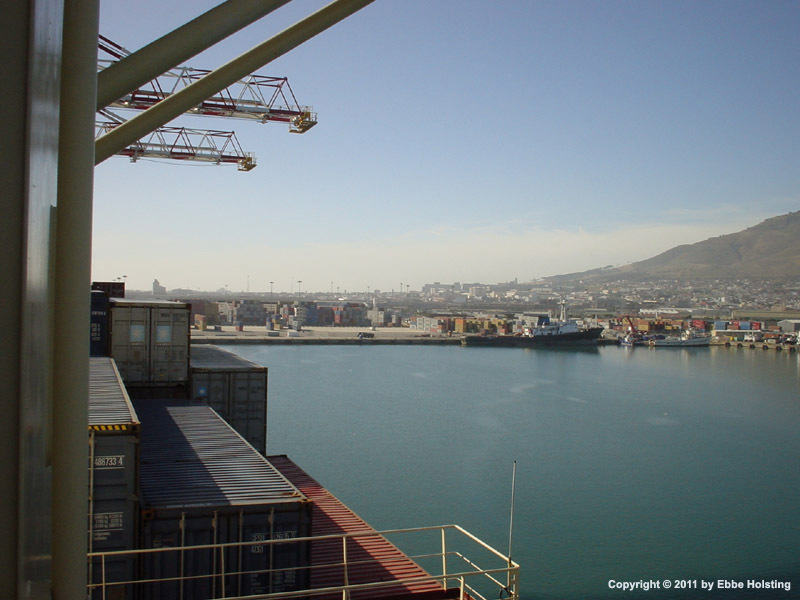 After completing my Dual Senior Officer Exam in October 2009, my first ship upon returning to the fleet was the Lars Maersk, a 4000+ TEU container vessel operating on a route from Northern Europe via Las Palmas to South Africa, calling Cape Town, Durban and Port Elizabeth. I spent 11 great weeks onboard as a Dual Purpose Maritime Officer, alternating between the bridge and engine room. A view of the forward part of the accommodation. 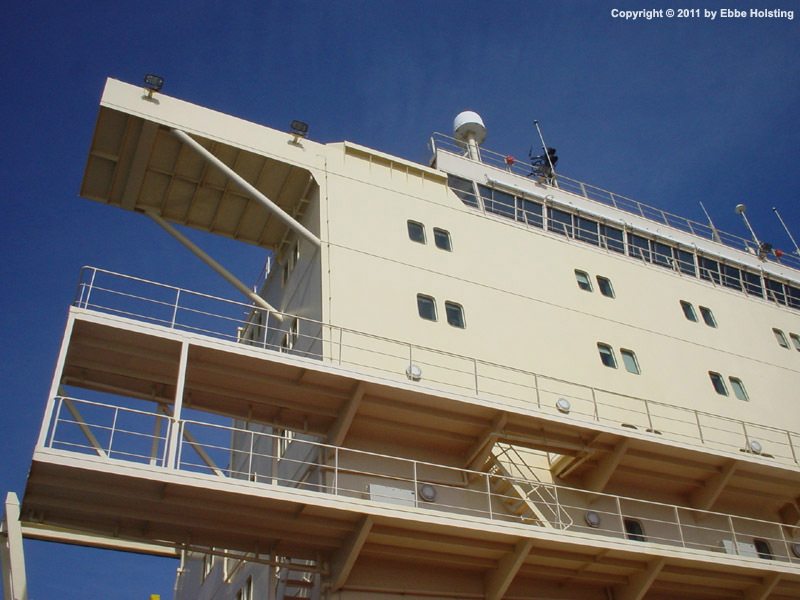 The catwalks running athwartships on the forward part enable access to reefer containers stacked on the hatch in front of the accommodation. 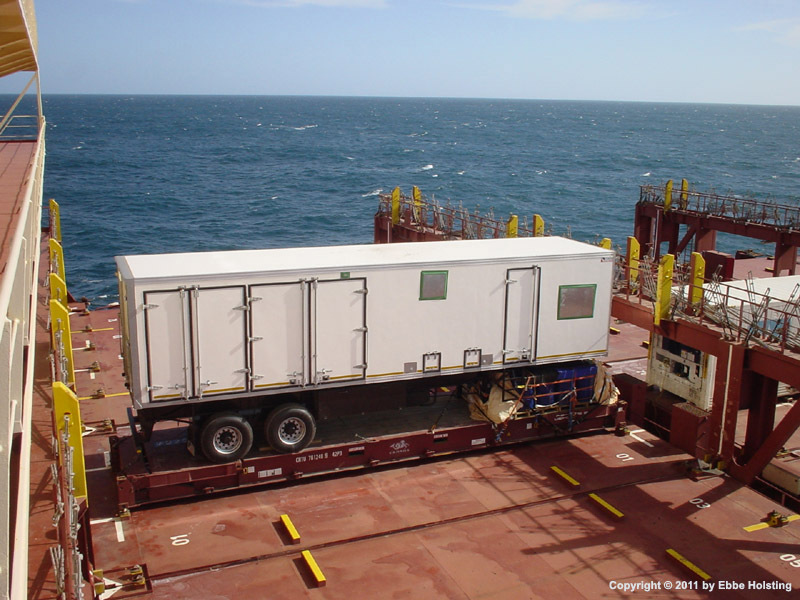 The onboard Reefer Electrician checks all reefers daily to make sure that temperatures are kept within the preset range. At the time of this image, however, we did not have any reefers on the bay immidiately in front of the accommodation. The small grey boxes on the forward part of the accommodation, right next to some of the windows, contain power outlet sockets for the reefer containers. 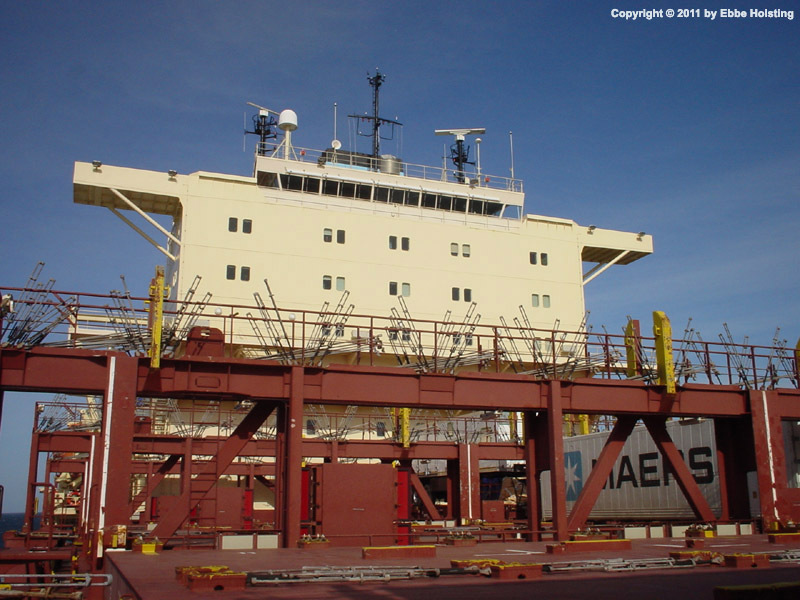 The reefer catwalks enable reefers to be stacked up to 4 containers high on the hatch in front of the accommodation. Elsewhere on deck they can typically only be stacked 2 high, in order to be accessible for daily checks. 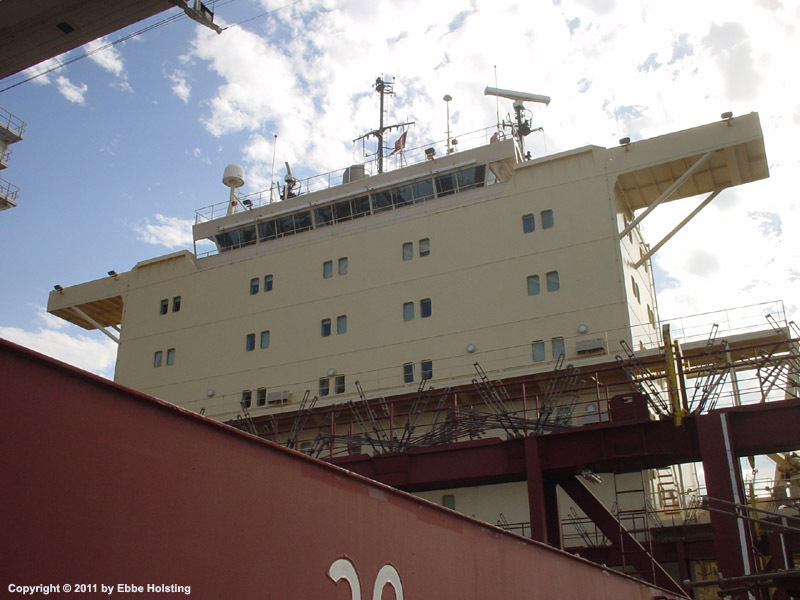 The accommodation viewed from the forward deck area, not much cargo on deck in this situation. 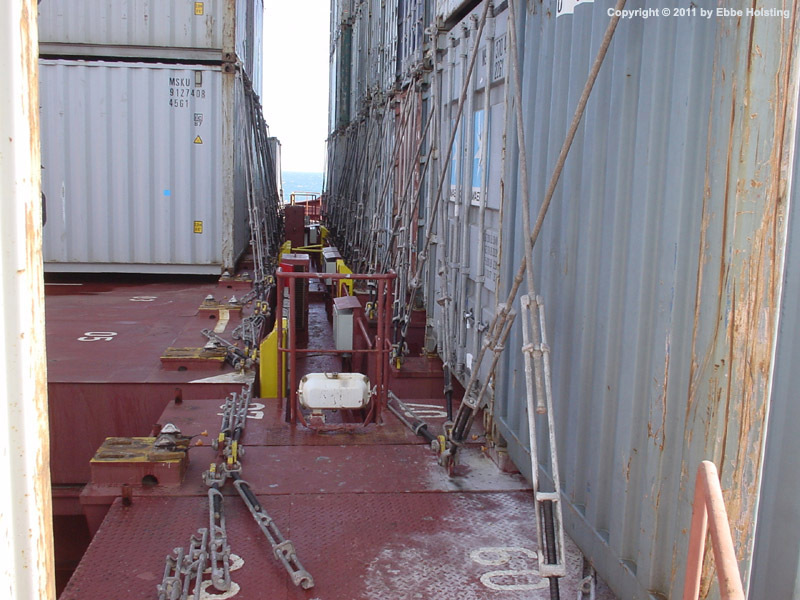 Notice the lashing equipment stored neatly on the lashing bridge, enabling easy access when lashing containers. My cabin was the two windows in the center, two decks below the wheelhouse windows. I had a nice view ahead where there was little cargo on deck! 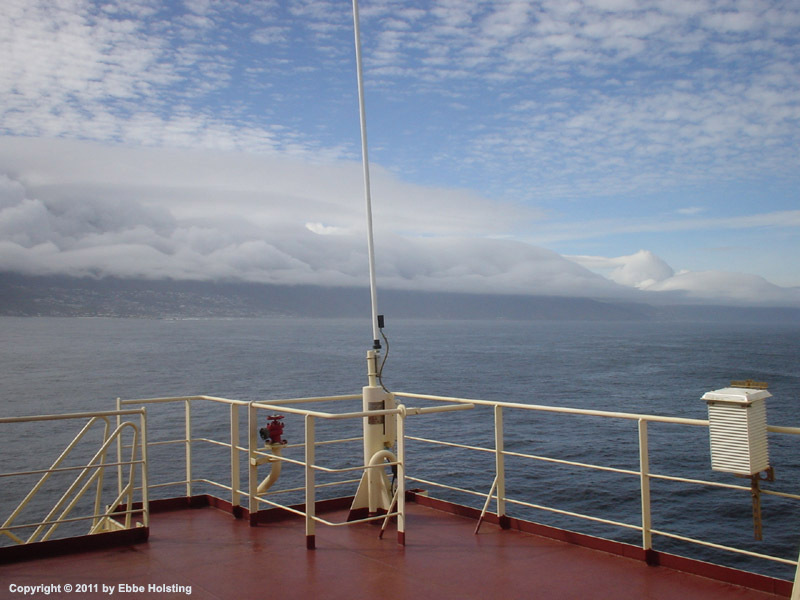 Looking ahead during normal crusing off the coast of southern Africa. 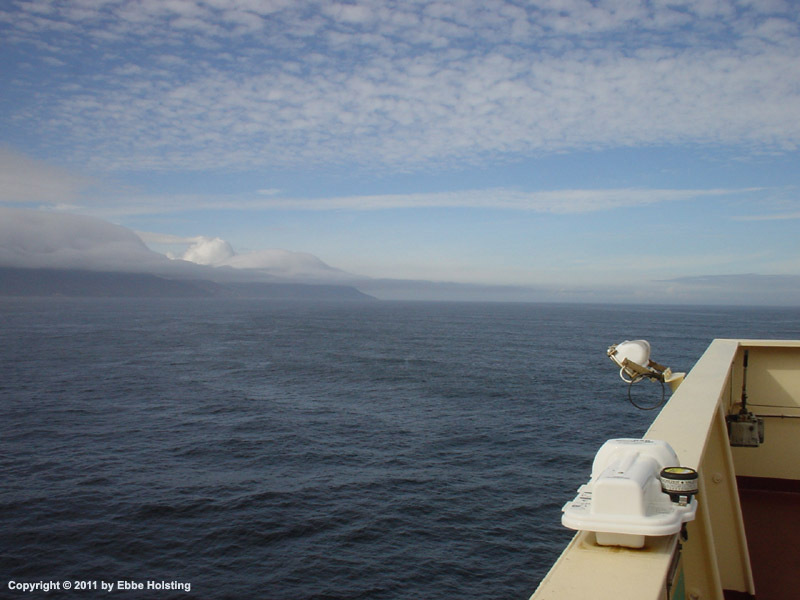 A view of the aft deck during normal cruising. Reefer containers are stacked on the aftmost bay, with the cooling unit end showing. Reefers are only stacked this high when empty, since naturally the top ones aren't accessible and therefore cannot be connected or checked, or repaired if neccessary. 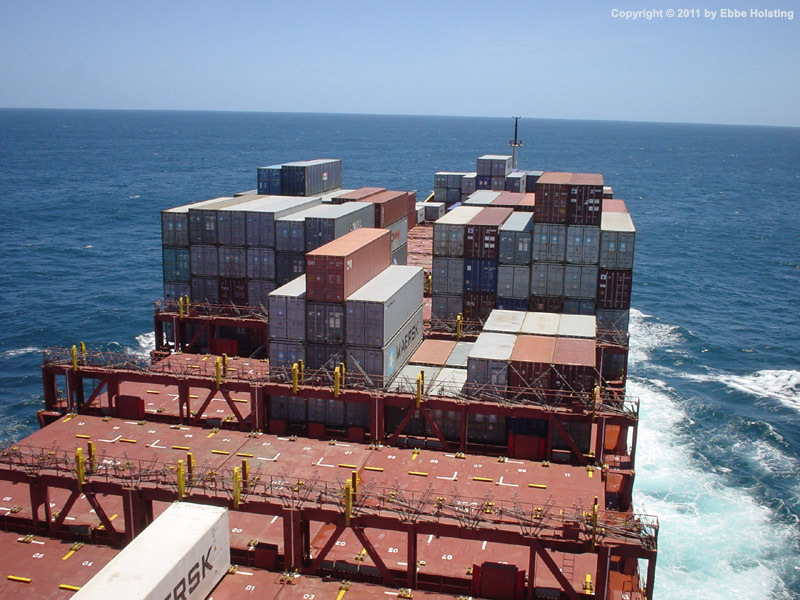 Almost anything can be transported on a container vessel! Here a trailer is loaded onto a flat rack container. 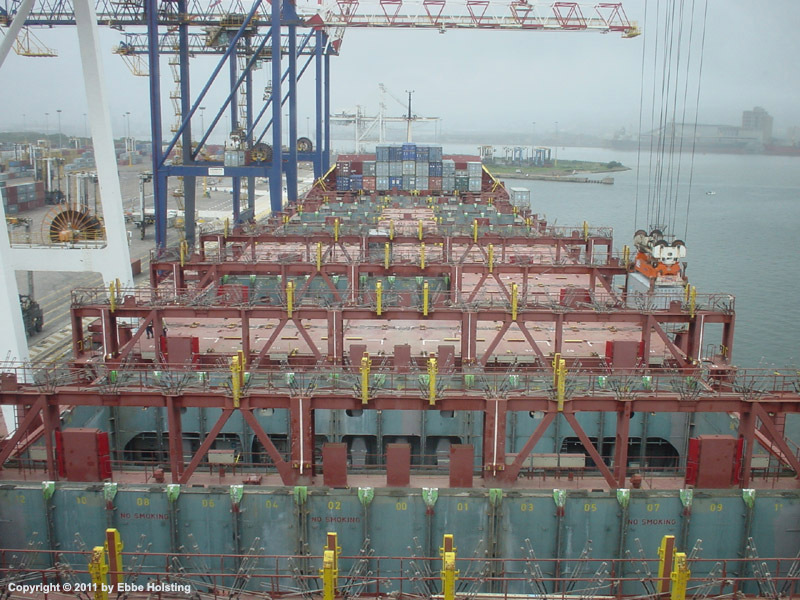 Special cargoes like this is becoming more and more common with A. P. Moller - Maersk, other examples include trucks, tractors, boats, battle tanks etc. For larger commodities, a number of flat racks can be positioned next to each other, forming an artificial deck onto which huge goods can be lashed. A view of the navigational bridge during normal cruising. The left of the bigger screens is the radar monitor. It was turned on, dispite appearing to be off. 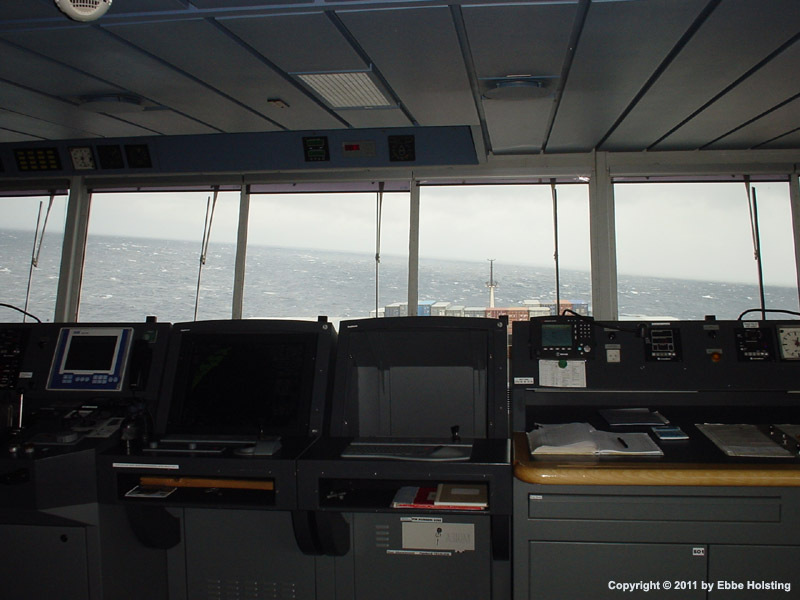 The one to the right is the electronic navigational chart (ECDIS), however this one was temporarily out of order. 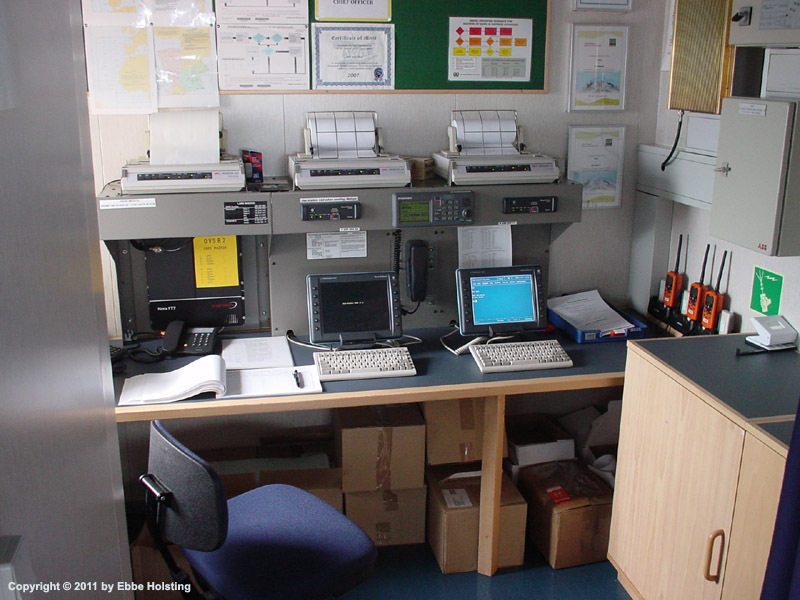 We had another ECDIS station on the aft part of the bridge though, but in essence they are only "extra help", since the regular paper charts are still used (and preferred by many). The ship's Global Maritime Distress and Safety System (GMDSS) compliant radio station, equipped with sattelite-based communication as well as medium/high frequency radio. Navigational warnings, weather forecasts and ship-addressed messages from the company or agents in upcoming ports of call are received via these systems. The ship is further equipped with VHF (Very High Frequency) radios on the bridge for close range ship-to-ship or ship-to-shore communication. 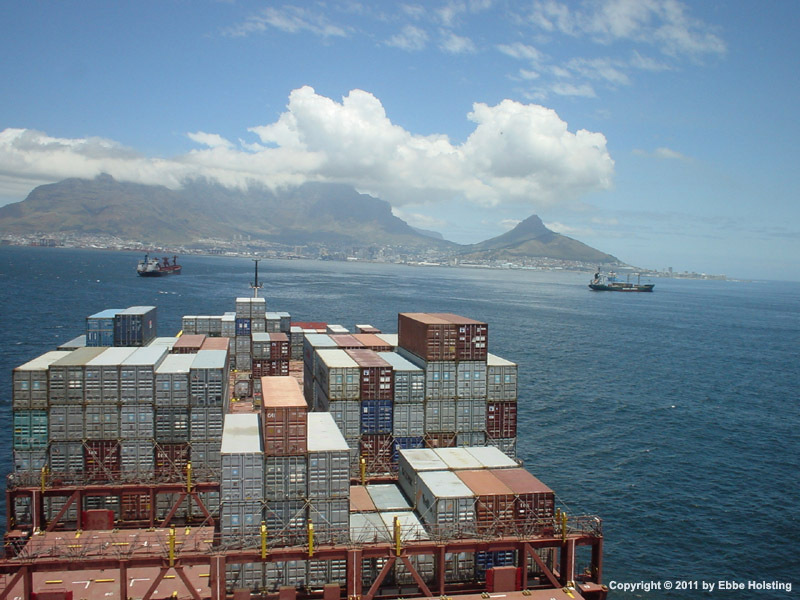 During 2010 all Maersk container vessels were fitted with internet connectivity. Viewing the Monkey Island from starboard bridge wing. One of the ship's typhoons (fog horn) is visible on the top of the funnel. Two radar scanners are also visible, each on top of their own mast. The smaller one (left) is for the 3 cm radar (better resolution), and the larger one is for the 10 cm radar (larger range). 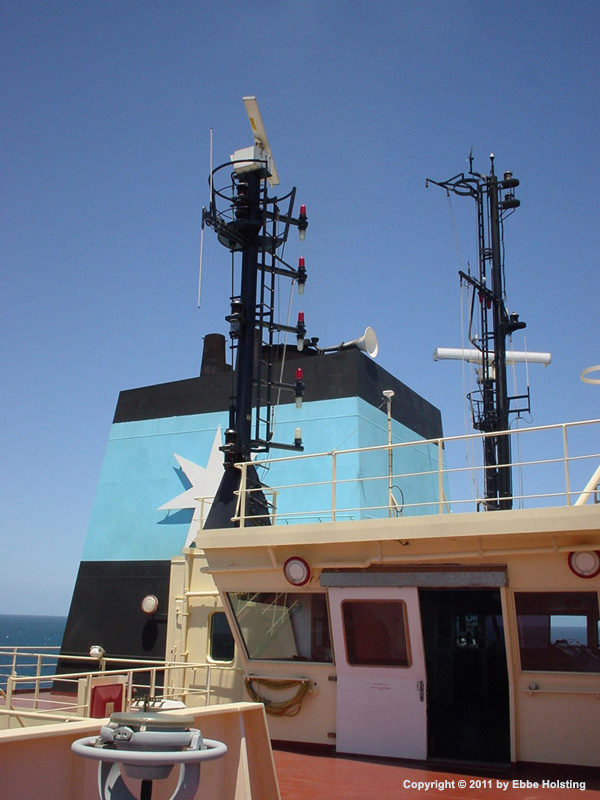 These are the two common types of radar used on merchant vessels today. A view of the top of the wheelhouse, called the "Monkey Island". In the starboard mast we are flying the South African flag (we are approaching harbour at the time of this picture). In the top mast we are flying the red flag ("Bravo"), signalling that we are carrying dangerous / hazardous goods. Container ships are almost allways carrying some sort of dangerous goods: chemicals, oxidants, flammables, compressed gasses, explosives, toxics etc. 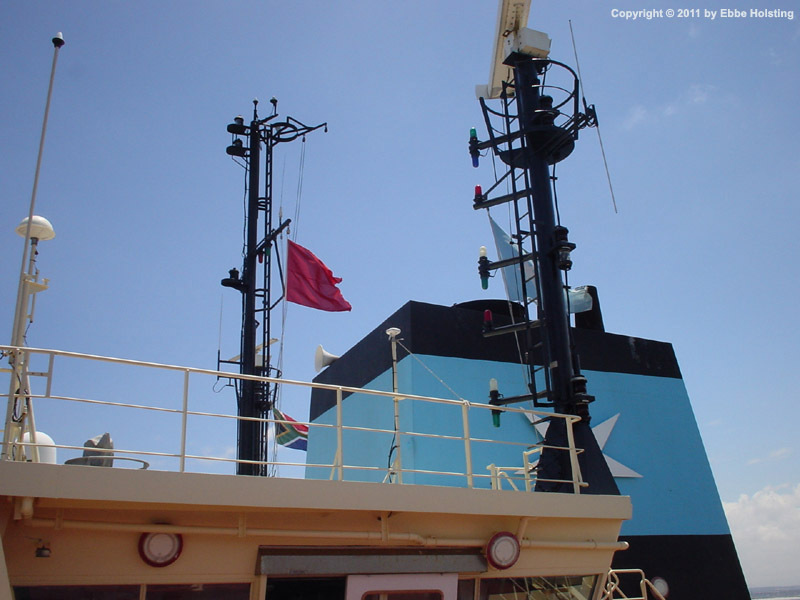 In the port mast we are flying the company flag, the light blue triangular flag with the white 7-armed star. 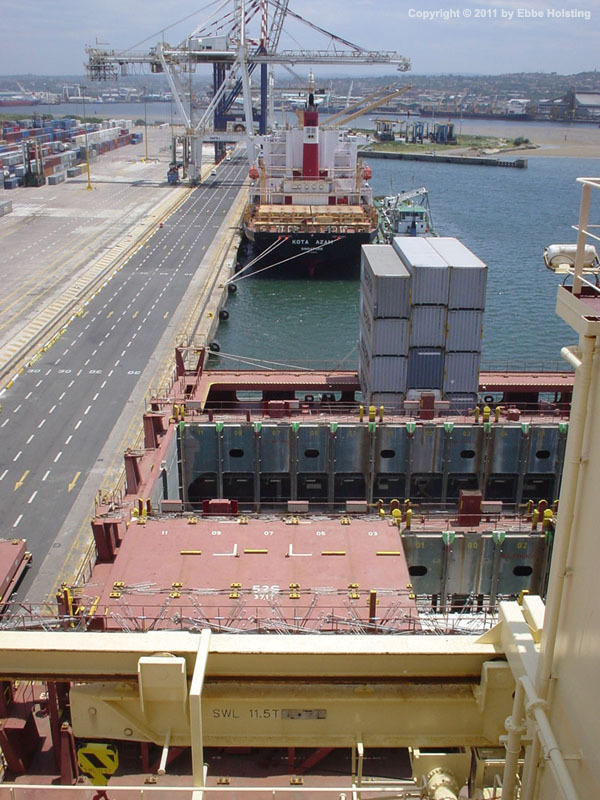 Alongside in Durban, South Africa, the final port on the route. The ship was almost completely unloaded here, and reloaded with cargo for Europe, including almost full reefer load with exotic fruits, wine etc. The port stay in Durban was usually one of the longest on the route, stretching to nearly two days. The forward most hatch, Bay 01. Due to the aquadynamic shape of the ship's hull, there is only a center cargo hold this far forward. This hold had room for 4 containers. 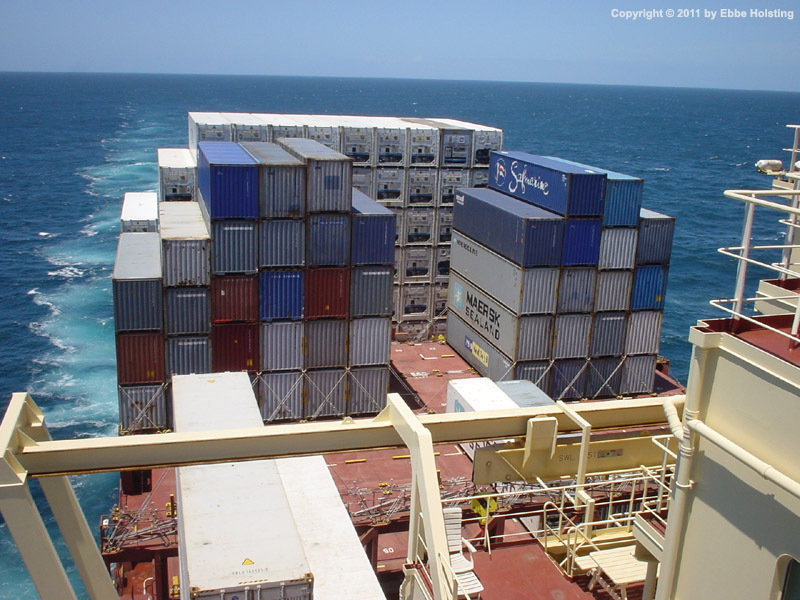 Not an inch of space is wasted onboard container carriers! Lashing equipment is seen near the ends of the hatch and in the middle (used for lashing 20 foot containers). A view of one of the the catwalks between the hatches. 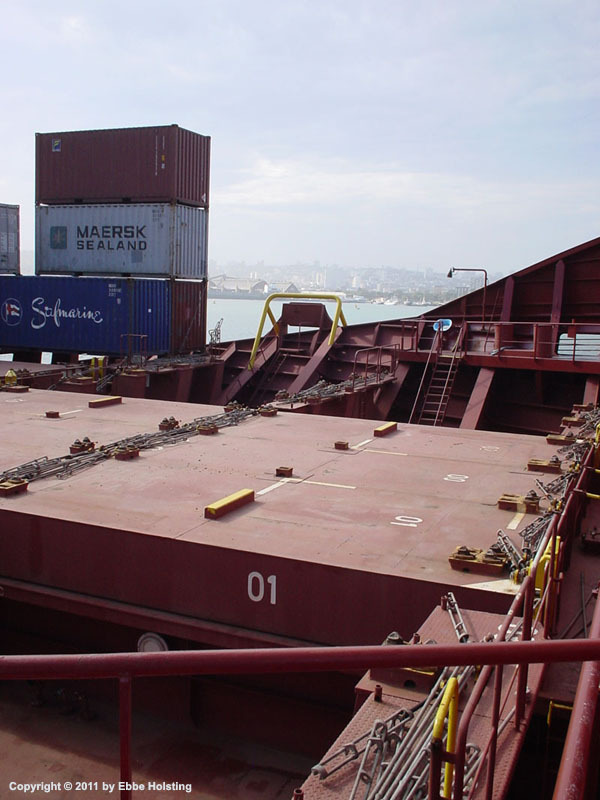 Containers are securely lashed, as seen, in addition to being locked in each corner to the hatch or container below it by a twist lock. Two twistlocks can be seen in the bottom left corner of the picture, sitting in an un-occupied container socket. Lashing is carried out be stevedores from the harbour, but they are inspected by the deck officers before heading out to sea. 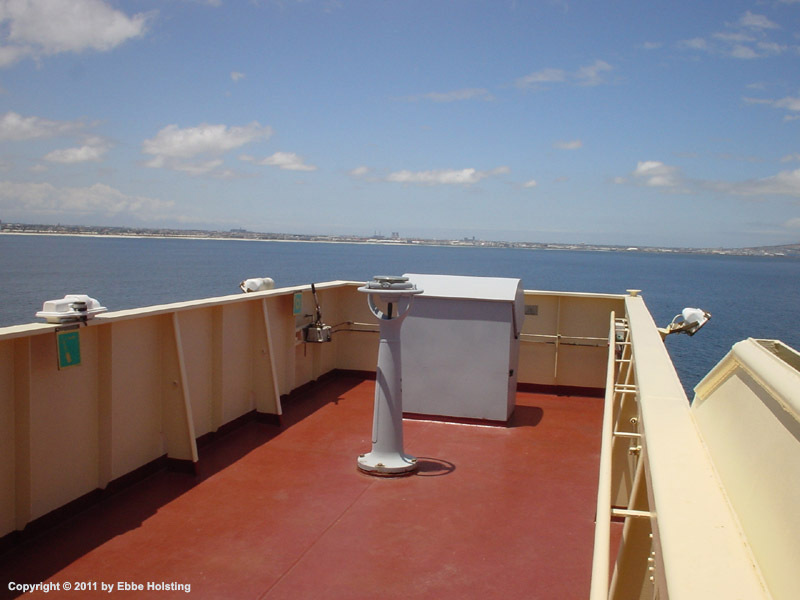 Alongside in Durban, South Africa, overlooking the aft deck where a couple of hatch covers have been taken off for access to the cargo holds. 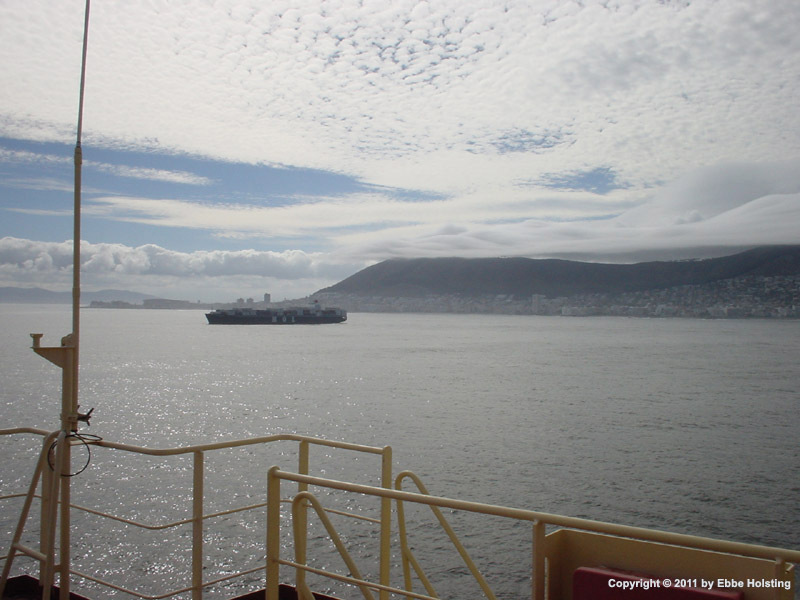 Anchored off Cape Town, South Africa, waiting for a berth to be available. Here looking towards the city and the iconical Table Mountain. A look in the other direction towards the other side of the bay. A gyro compass repeater is seen on a pedestal, and the box behind it is a manoeuvre desk, enabling the Captain to berth the ship standing in the bridge wing for better view. 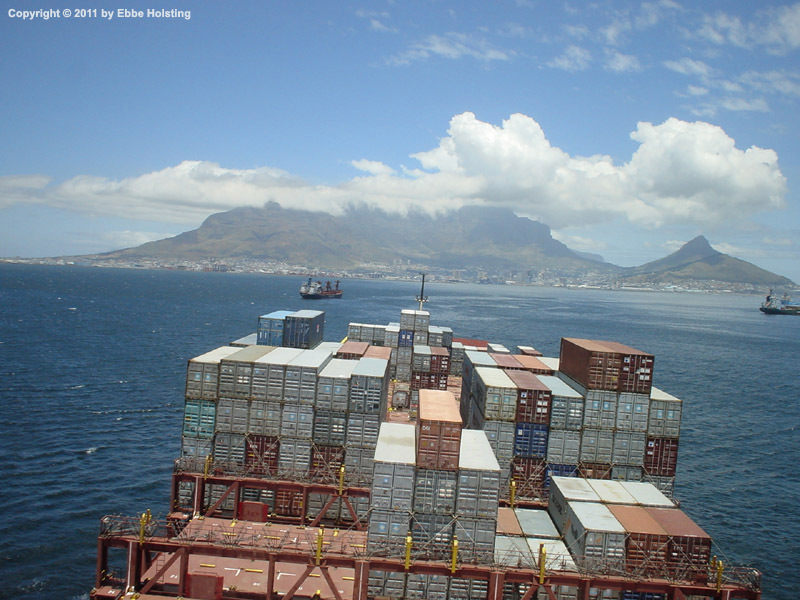 Cape Town anchorage. Here we encountered an unfortunate right angle between the wind and swell direction. When anchored, the wind turns the ship head-on into the wind, thus causing the swell to come in from abeam, so we had to endure some heavy rolling for a couple of days. 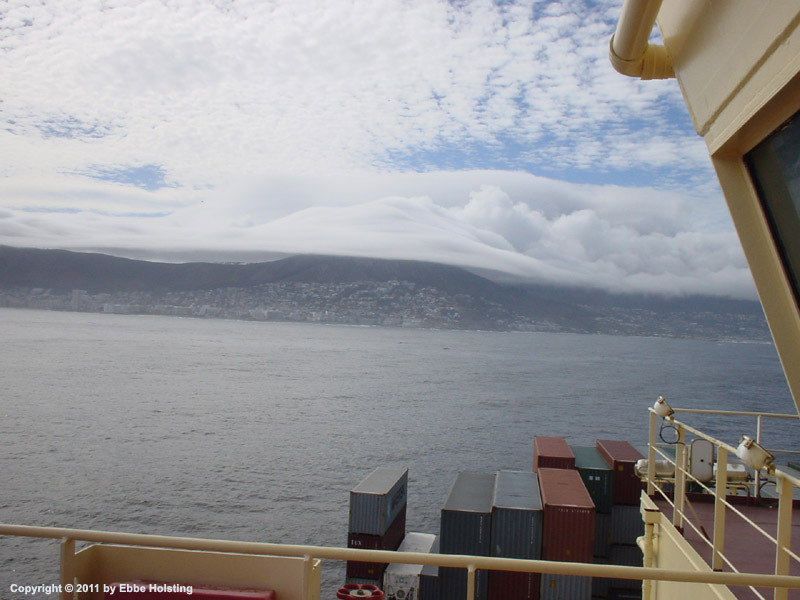 Table Mountain creating a leeward, which is evident by the ship to the right (also anchored) heading a different direction than us, thus not as troubled by the swell as we were. The surface of the water also looks markedly more calm. 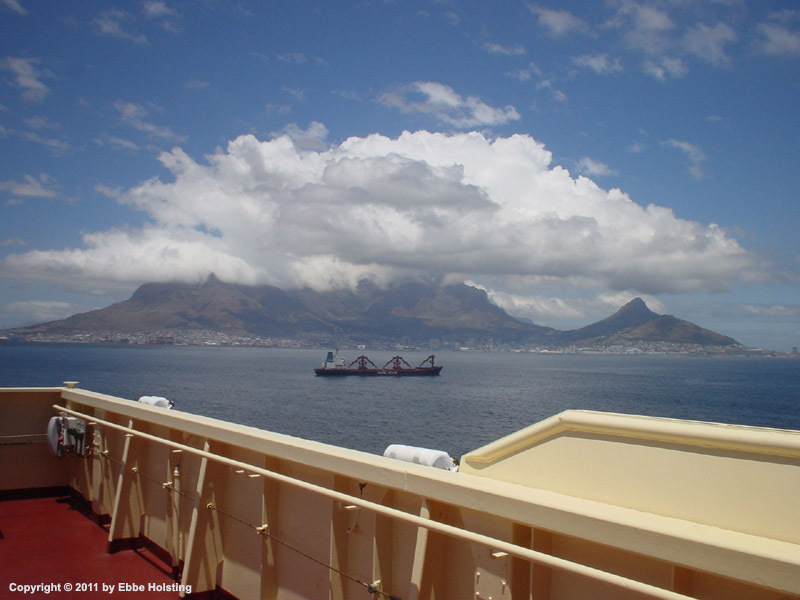 We spent almost a week anchored off Cape Town, awaiting berth. 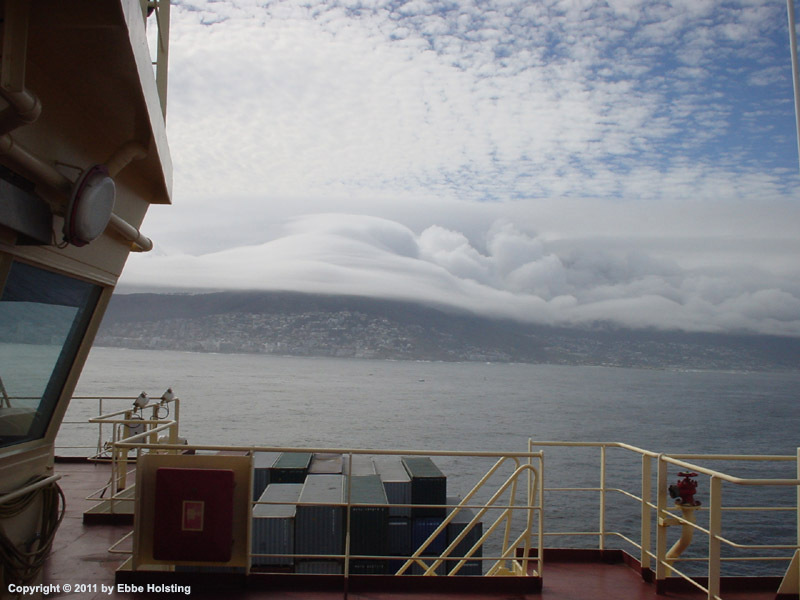 One day these fantastic clouds formed over Table Mountain and the surrounding mountains. 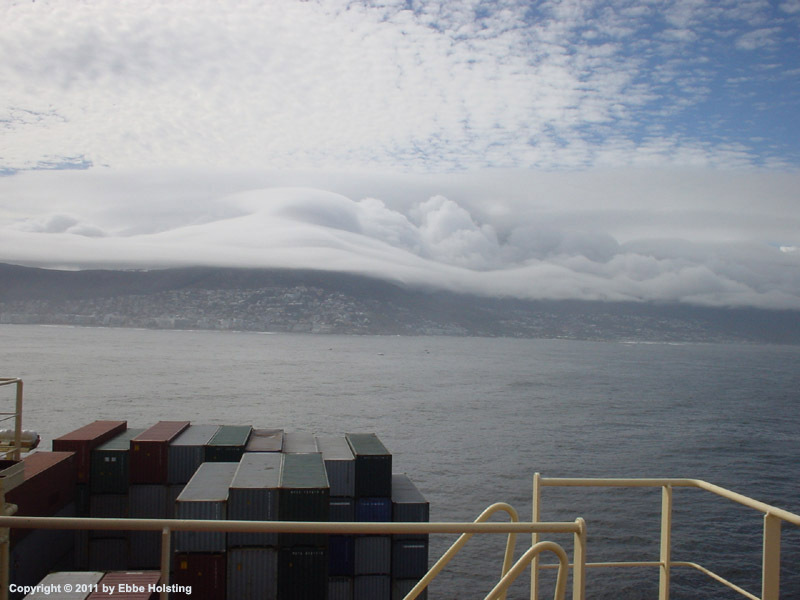 These clouds are formed when warm, moist air reaches the side of the mountains, and is carried up along the sides of the mountains by the wind, thereby cooling down the air. 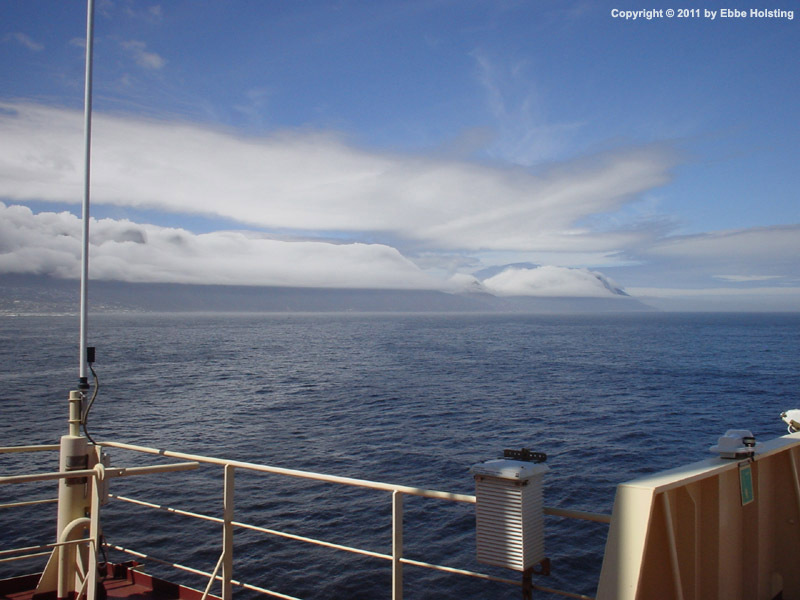 When reaching the dewpoint, clouds are formed. Almost resembles a piece of cloth covering the top of the mountains! 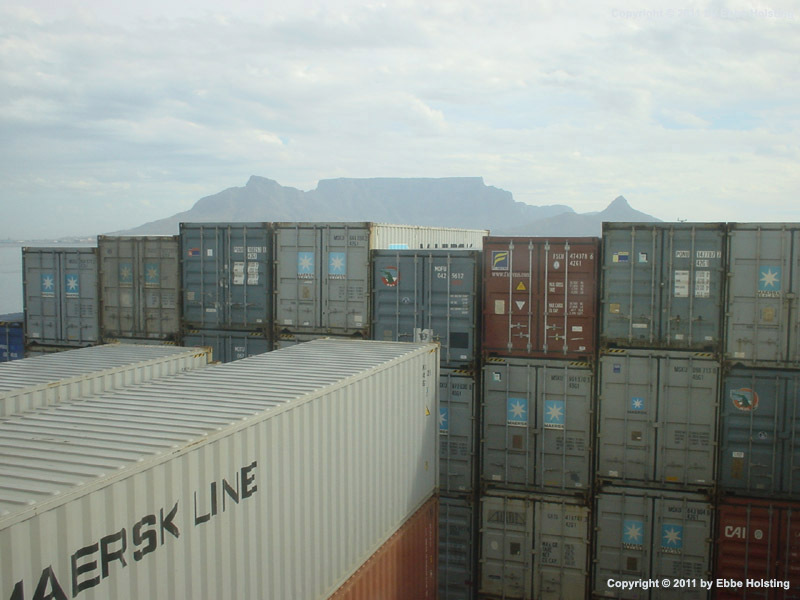 Table Mountain, Cape Town, seen looming over the containers on the aft deck. 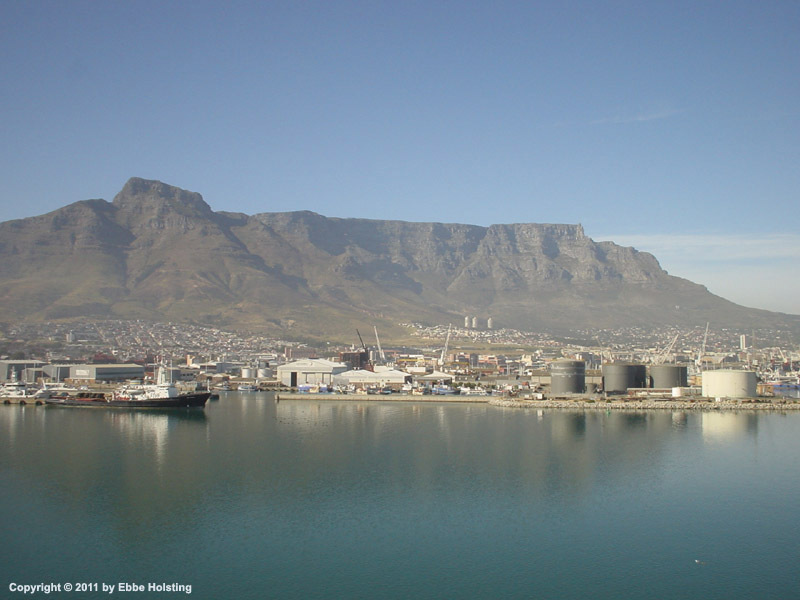 The characteristic Table Mountain towering over the city of Cape Town, South Africa, it's highest peek being 1084 meters (3558 feet) above sea level. 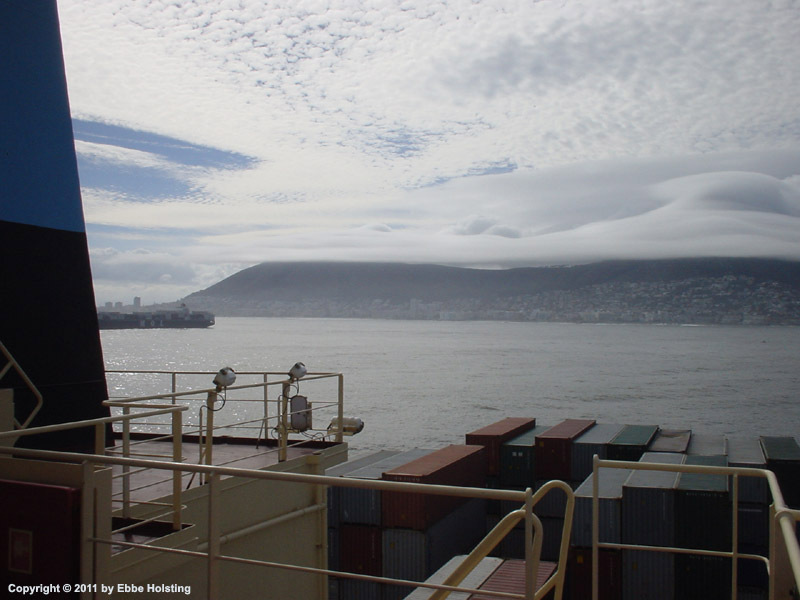 Finally coming alongside in Cape Town, South Africa. 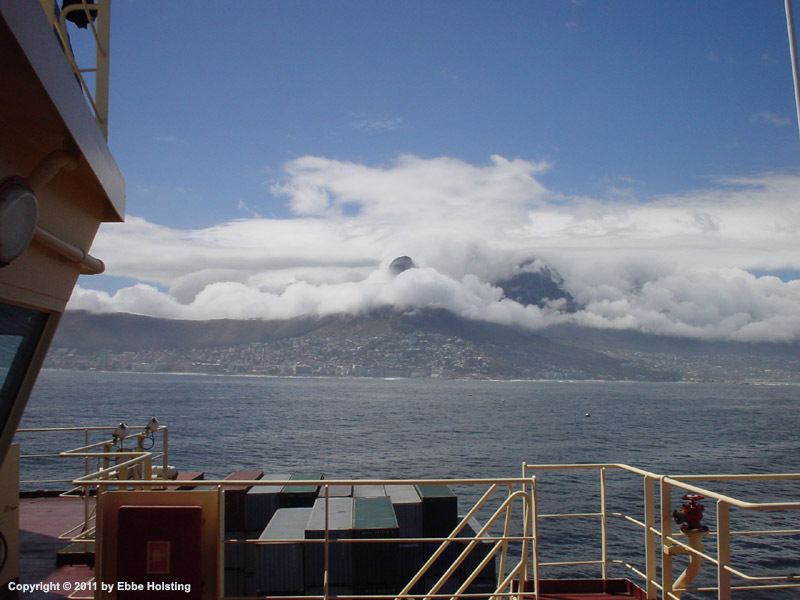 Cape Town is one of the greatest places I have visited by ship. I managed to get shore leave a couple of the times we called this port. It was just before the 2010 Football World Cup, held in Cape Town, so there was an expectant exciting atmosphere everywhere. On this occation though, Cape Town meant the end of the journey for me. I had been on board for 11 weeks, and it was time to return home to Denmark for 11 weeks leave!